Software-intensive systems are omnipresent: Whether in finance and healthcare, in aerospace or traffic, software plays an ever greater role. In order to remain competitive in the market, manufacturers are more and more under pressure to deliver high-quality software systems quickly and reasonably priced. The most effective way to ensure the quality of a software product is testing. Leading experts in the field of quality assurance are convinced that the most promising approach to mitigate those challenges is Model-Based Testing (MBT). MBT uses formal models to improve automation, documentation and transparency of the entire software development process. This results in a more efficient development process – in time and costs – the main target of the Fokus!MBT tool chain. Fokus!MBT is an integrated test modeling environment that guides the user along the methodology of Fokus!MBT and thereby simplifies the creation of the underlying test model. The modeling notation used by Fokus!MBT is the UML Testing Profile (UTP) specified by the Object Management Group. It is a test-specific extension of the Unified Modeling Language (UML), which is prevalently used in the industry. This enables testers to rely on the same language concepts as system architect and requirement engineers, which overcomes problems in communication and support the mutual comprehension. 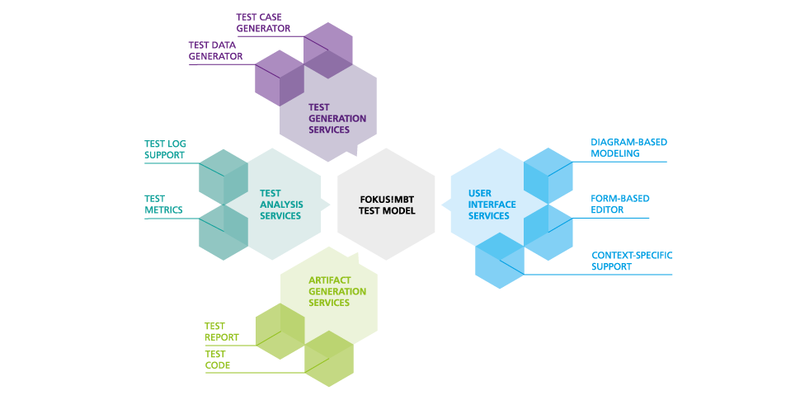 Interface description for test cases and/or test data generators, test script generators, test result feedback from different test execution platforms, report engines etc. Fokus!MBT is based on the flexible Eclipse RCP platform, the Eclipse Modeling Framework (EMF), and Eclipse Papyrus. As a UTP-based modeling environment it is equipped with all UML diagrams but it also includes additional test-specific diagrams. Besides these diagrams, Fokus!MBT goes for a proprietary editor framework to visualize and edit the test model. On top of these features, Fokus!MBT integrates automated modeling rules which ensure the compliance of guidelines - particularly modeling and naming conventions - after and during working with the test model. These constructive quality assurance mechanisms distinguish Fokus!MBT from other UML tools, accelerate the creation of the model and minimize cost-intensive review sessions. The consequent and continuous traceability among requirements and test artifacts is indispensable, but not sufficient. Fokus!MBT takes a major step forward by integrating the test execution results into the test model's inherent traceability network. This establishes a consistent traceability network between requirement, test case, test script and test execution results, making conclusions about the coverage of the particular requirement or the test progress itself immediately calculable. Furthermore the visualization of the test execution results allows a detailed analysis of the test execution flow to preprocess and ultimately evaluate the test results. Thus the test model includes all relevant information to assess the quality of the system under test in order to support the management in its decision making with respect to the release of the system.